Overall, we found the 6GB RAM ASUS ZenFone Max Pro M1 to be a nice value buy, especially for those who need that longer battery life. The larger memory does mean there’s more storage in the device and the 16MP camera upgrades certainly do help in taking better photos or even selfies. So if you didn’t buy the 3GB RAM version before due to the cameras, RAM or storage, then this 6GB RAM version is definitely the device to get but to know more, we'd suggest reading the 3GB RAM versions review. Overall, the Asus Zenfone Max Pro M1 has very capable set of cameras which won’t disappoint you under well-lit conditions, be it the rear or the front facing shooters. Under low light as well, images look usable, but something like a Redmi Note 5 Pro would serve the purpose better despite having a narrower f/2.2 lens. So, if you’re looking to get the 6GB variant of the Asus Zenfone Max Pro M1 and were sceptical about its camera performance, we hope we’ve made your job easier with this review. I like what Asus has been doing with its smartphone this year. The ZenFone Max Pro M1 with 6GB RAM is a great example that the company has finally understood that people will instantly buy smartphones from good companies if they come with a great performance per rupee value. The Zenfone Max Pro M1 with 6GB RAM does exactly that. The new 6GB version of the ZenFone Max Pro M1 is an extremely capable smartphone, and is well worth its Rs. 14,999 price tag. Battery life is stellar, performance is great, the software is fluid, and build quality is top-notch. The rear camera setup is also improved, and captures more more detail in all lighting conditions. However, there are a few rough edges. The rear camera's autofocus is unreliable, and the front camera is not really an upgrade compared to the lower-end variants. 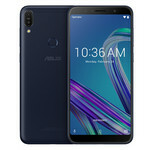 The ASUS ZenFone Max Pro M1 (Price Check) is the latest ZenFone Max model to be released by ASUS. It follows up on the success of the ZenFone Max Plus M1 (ZB570TL) we saw just a few months ago, and directly challenges the Xiaomi Redmi Note 5. Unless you can pick up the ZenFone Max Pro M1 at one of ASUS’ borderline ridiculous flash sales on Lazada. During this sale, the phone will be retailing for just RM599, which at that point is just an absolute no-brainer. Asus ZenFone Max Pro M1 Review: Ultimate Battery King Phone? All in all, the Asus ZenFone Max Pro M1 is a worthy upgrade from the ZenFone Max M1. The device produced a vibrant display and it was able to withstand heavy games like Asphalt 8. Furthermore, it was able to take decent photos. The Asus smartphone did great on the battery category as well and it was able to live up to its title. Of course, the final decision will still depend on the user. The Asus ZenFone Max Pro M1 is definitely a commendable mid-range smartphone. It provides great value for money, it has incredible battery life, and while its software needs some polish, stock Android is still a desirable feature in a smartphone. The only thing the Max Pro cannot deliver is in the camera department. ASUS ZenFone Max Pro M1 Review: The New Mid-range King? If you’re the sort that values a non-bloated UI, pure performance and battery life above image quality, we say go for it. The ASUS ZenFone Max Pro M1 is a pretty capable phone, though its cameras struggle a little bit with low-light, as do most phones in its price range. The ASUS ZenFone Max Pro (M1) is a great smartphone, thanks to its vibrant display with good color reproduction, powerful CPU and GPU, Pure Android experience, and large battery capacity with impressive batt life. It certainly redeemed the series by providing one of the best price-to-performance ratios in its segment. With a tag of Php9,995, the Max Pro M1 is a definite steal. Clearly, the highlights of Asus Zenfone Max Pro M1 are big 5,000mAh battery and stock Android experience. But it has own demerits and grapples with some major issues. If you just want to buy a phone for a high battery life, Zenfone Max Pro M1 is worth considering. But if you’re looking for a well-packaged phone, Redmi Note 5 and Note 5 Pro are worth considering. Only thing you will miss out on is a bigger battery, but Redmi Note 5 phones aren’t slouch in terms of battery life either. At Php 9,995, the ZenFone Max Pro M1 is certainly an interesting proposition. It’s priced lower than the Redmi Note 5, though take note that only the 4GB/64GB version of that particular smartphone is being sold (officially) in stores. Will the battery king reign supreme over its competition? We’ll find out in our full review. With the great combination of hardware, dual camera and stock android, Asus Zenfone Max Pro M1 is perfect device at this price point. Overall, ASUS have done a very good job with the ASUS ZenFone Max Pro M1, offering an affordable yet midrange device dedicated to long lasting performance and gaming for Malaysia’s masses. With solid design and solid camera performance, the ZenFone Max Pro M1 won’t turn heads or take excellent photos (unless you’re an experienced photographer like Peter M Tan) but the big battery and RM699 price tag make it a great new entry level device for the new ASUS ZenFones, setting the bar high for other entry-level devices. ASUS ZenFone Max Pro M1 Review: Snapdragon 636 + 5000mAh battery for RM599! Is This The Real Deal? In a nutshell, the ZenFone Max Pro M1 delivers its purpose as a powerful mid-range phone with a insane battery life, its hard to find any fault with it apart from some minor performance issues and the camera’s image quality, which isn’t a deal breaker considering what ASUS has offered on the table. The ZenFone Max Pro M1 goes official on May 31st 2018 with an expect retail price of RM699, there is however a 6GB RAM model being mentioned to us during the briefing, which will obviously perform much better than my current review unit with a better main camera system, ASUS is definitely giving Xiaomi’s Redmi Note 5 a run for its money for what it has done on this phone, especially if you prefer a clean Android experience and want to have that insane battery life. The last couple of years really saw brands duking it out in the mid-range but we’re seeing the battle spill on to the sub-10k price point as well. While there are a lot of choices to consider in this price bracket, there’s only a handful that offers the same lasting power that the “Battery King” line of devices offer. If you’re looking for a device that has the ability to last a full day without having to top it up with a power bank or a power outlet, the Asus Zenfone Max M1 should definitely make it to your shortlist. On top of that, you’re getting a nice and tall display plus a decent processing package that can still handle the day-to-day and a bit of gaming too. The Asus Zenfone Max Pro M1 is priced at Rs. 10,999 for the base 3GB RAM/32GB storage variant and Rs. 12,999 INR for the 4GB RAM/64GB storage option. The 6GB RAM/ 64GB storage option with improved cameras will be available later for Rs. 14,999. At these prices, it is a solid phone for anyone looking for Redmi Note 5 or Redmi Note 5 Pro alternatives. The Zenfone Max Pro could definitely improve in the camera and battery departments, which is actually a great position to be in since a lot can be done there with future software updates. That said, the Asus Zenfone Max Pro (M1) is a top-notch value-for-money device that can take on the best in the market with ease. ASUS ZenFone Max M1 Review – Battery King? Unfortunately, this new ASUS ZenFone Max M1 did not meet our expectations, especially in the battery department. ASUS claims it to be a battery king but didn’t deliver its promise of long battery life. On the bright side, it was able to take great selfies even in low lighting conditions. It also has decent display despite its low resolution, and can play games smoothly. With its PHP 8,995 price tag, is this smartphone worth it? If you ask us, it could’ve been better if they toned-down the price a little bit more since numerous smartphones from other brands offers greater performance in this price range..But it’s till up for you to decide. Will you get yourself a new Asus ZenFone Max M1? Or if you already have one, did you encounter the same difficulties like we did? Comment down below! So here's the thing. If you're planning to buy the Redmi Note 5, you should drop that plan, and get yourself a ZenFone Max Pro M1 instead. If you're planning to buy the Redmi Note 5 Pro, you should go buy it, but make sure you check out Asus' new phone too, just in case. For now, even Asus is selling the ZenFone Max Pro M1 through weekly sales on Flipkart. Like Xiaomi with its Redmi Note 5 Pro. To say that the ZenFone is more readily available than the Redmi won't exactly be fair for now. Both the phones have their own merit, and while I still like the Redmi Note 5 Pro more, the ZenFone Max Pro M1 is the most formidable opponent it can get at this point of time. The Zenfone Max M1 is yet another device that seems to fall short in delivering on its promises. The phone could’ve easily been a strong contender in the budget segment if not for its disappointing battery. Thankfully, it has some redeeming qualities such as a respectable screen, a good performance, and an acceptable set of cameras. Add that to the fact that even though it is supposed to be a toned-down version of the Max Plus M1, it has better overall performance. Priced at Rs 10,999 for the base 3GB RAM variant, the ASUS Zenfone Max Pro M1 beats the competition with Stock Android, 2 major promised updates, better battery life and great performance. Probably the only downside is the camera performance which could be improved with future updates. The Asus ZenFone Max Pro M1 is a very aggressively positioned device. With the device, Asus has taken practically every step possible to counter the competition. The price is lower, the specs match and exceed the best in the business and the execution is indeed very good. In the end, we can only conclude the ASUS ZenFone Max Pro should be your top consideration if you're in the market for a budget Android smartphone today. We hope to review it more in-depth in the future. 70% Asus Zenfone Max Pro M1 Review: Is it actually a Redmi Note 5 Pro killer? Asus Zenfone Max Pro M1 is undoubtedly good value-for-money, starting at Rs 10,999 for 3GB RAM and 32GB storage and going all the way up to 4GB RAM and 64GB storage for Rs 12,999. Asus has also announced an upcoming 6GB RAM variant that’s going to cost Rs 14,999. Asus has got a lot of things right this time around. It has got a good-quality display, better processor, bigger battery and stock Android experience. But it also has its shortcomings such as lack of Corning Glass Protection and oleophobic coating to the display, below par camera and battery experience, which makes us feel that Asus seems to have missed a great opportunity. The Asus Zenfone Max Pro was a perfect move by Asus to strengthen their hold in Indian market and give tough competition to its rival companies like Xiaomi and Oppo in the Indian Market. The Max Pro is almost close to perfection considering the specification it provides in the budget segment. Moreover even the highest variant is priced at Rs,12.999/- which is cheaper than the Redmi Note pro has successfully captured the attention of all the buyers. Considering the tight competition in the market this is a very good time for consumers, as we are close to acquiring the best of the technology in a budget that could be easily purchased by all. ASUS has almost made its way to acquire the budget segment leaving the well-known budget devices like Xiaomi Remdi Note 5 behind in performance. If we talk about its internals, the ASUS ZenFone Max Pro M1 sports a Snapdragon 636 SoC which is faster than that of several phones including the Motorola Moto X4, Xiaomi Redmi Note 5, Honor 7X, and Honor 9 Lite. For final thoughts, the Asus Zenfone Max Pro M1 is one promising device as it comes loaded with some impressive specs sheet and the performance is up to the mark. The same processor is available in the Xiaomi Redmi Note 5 Pro, but it cost you Rs 14,999 for the 4GB of RAM. The significant change is in the software and the stock Android experience could be a gamechanger for Asus only if it delivers timely updates, which it has promised incidentally. All in all, the Asus Zenfone Max Pro makes a compelling pitch to try the brand if you haven't done it before. ASUS ZenFone Max Pro M1 (ZB601KL) – Everything You Need To Know! The ASUS ZenFone Max Pro M1 (ZB601KL) is the latest ZenFone Max model to be released by ASUS. It follows up on the success of the ZenFone Max Plus M1 (ZB570TL) we saw just a few months ago, and directly challenges the Xiaomi Redmi Note 5. The strengths of the Asus Zenfone Max Pro M1 lie with its massive 5000mAh battery and stock Android 8.1 Oreo operating system. With a little better design and camera performance, the handset would truly have been a complete package to break the monopoly of the Xiaomi Redmi Note series in the budget segment. Stopping the Xiaomi juggernaut will require more than this from Asus. Having said that, the handset will pose a serious threat to the Note 5 series and surely gets our stamp of approval. The sides offer a power button and volume buttons on the right, a dual SIM tray on the left that hooks up a separate microSD card slot. The bottom offers loudspeakers, a micro USB, 3.5 mm headphones jack, and a microphone. On top, there’s a second microphone with no other ports. To conclude, the Asus Zenfone Max Pro (M1) certainly looks a device that could change Asus' faith as it bears some really impressive specs for the price point coupled with some premium looking design and near stock Android experience. The device will surely face a fierce competition with the likes of Xiaomi Redmi Note 5 Pro and from other Chinese players like Infinix, Tecno and more. 86% Asus Zenfone Max Pro M1 review, is this the Redmi Note 5 killer? The Asus Zenfone Max Pro M1 is an impressive handset that actually competes with the Redmi Note 5, in fact it is much better in almost every area and the price is just Rs. 1000 extra, makes sense to go with the Max Pro M1. Asus is going to get a lot of attention because of the pricing of the Zenfone Max Pro M1, and it's positioning itself squarely as a Xiaomi killer. The specifications match those of the Redmi Note 5 Pro, but there are a few extra perks such as the bigger battery, dedicated microSD slot, and front flash. However, the prices are more in line with those of the Redmi Note 5, which is one rung lower in Xiaomi's lineup. We also now know what the Moto G6 lineup will be like, and it seems that there won't be any challenge from that corner in terms of specifications, at least. The Asus Zenfone Max Pro can take on the best in the market with ease. Like most Asus phones, the spec-sheet is maxed out with the best mid-range hardware. That includes latest stock Android and a 5,000mAh battery, two features which solve the biggest pain points people tend to have when making a purchase at that price range. The phone even manages to take on the formidable Redmi Note 5 Pro, save for the imaging prowess, but the pros easily outweigh the cons. In all, it’s always good to have a choice of clean stock UI without compromising on the performance. Also, the reasonable price of the Zenfone Max Pro makes it a favorite in the mid-range smartphone section. You will have to pay Rs.10,999 for a 3GB / 32GB phone and Rs. 12,999 for 4GB / 64GB phone. It would be exclusively available on Flipkart from May 3, 2018. Positive: High performance; long battery life; nice display; decent cameras. 78% Recensione ASUS Zenfone Max Pro M1: 5000 mAh vi bastano? Positive: Powerful hardware; good price; solid battery life; excellent performance; impressive cameras. Negative: Slow charging; mediocre speakers. Positive: Powerful hardware; excellent display; long battery life; nice speakers; attractive price. Negative: Poor cameras; no fast charging. Positive: Nice performance; high autonomy; good price. Negative: Poor cameras; mediocre design. Positive: Good price; decent hardware; very long battery life; nice performance. Positive: Very long battery life; low price; decent hardware; nice gaming performance. Positive: Large battery capacity; powerful processor; nice display; triple SIM slots; fast fingerprint sensor; nice main cameras. Negative: No quick charging; mediocre design; poor connectivity. Positive: Decent hardware; nice performance; long battery life. 82.32%: This rating should be considered to be average. This is because the proportion of notebooks which have a higher rating is approximately equal to the proportion which have a lower rating.